It's been a long school year, and summer calls. Where can you find a one-stop shop to unwind, get wet and go to worship? The summer camps offered by the Florida Conference Camps and Retreat Ministries, of course. There are four to choose from, each offering a unique experience but all emphasizing ways to build or strengthen a relationship with God. Registration for Christian-themed summer camp opportunities at all four Florida Conference sites is available at www.flumcamps.org. Each camp has a different focus, so be sure to click the links for each one before you decide. 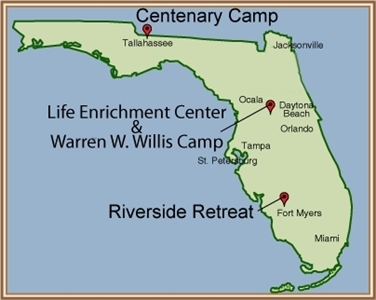 Registration is open at Warren W. Willis Camp and the Life Enrichment Center, both near Leesburg; Centenary Camp in northwest Florida; and Riverside Retreat in South Florida's rural wilds near LaBelle. Information about summer camps and links to each camp website can be found at www.flumcamps.org. Young people can sign up to spend a week or spend a day, stay in Florida or travel to the Appalachians, hang out with peers or have fun with family. "Now's a perfect time to do that," said Mike Standifer, director of Warren Willis Camp and executive director of Camps and Retreat Ministries. He said almost 4,500 people, mostly kids and teens, took part in summer camp programs offered by the Florida Conference last year. Although the majority come from United Methodist churches in Florida, young people from other Christian denominations and out of state are welcome, Standifer said. The son of a UMC preacher, Standifer grew up attending what is now Warren Willis, formerly the Florida United Methodist Youth Camp. He loved the experience so much that he made camps his career, joining the staff in 1993. Some things have changed, like the shift to air conditioning and contemporary music praise bands. But the purpose of the Florida Conference camps remains the same, described by Standifer as providing a safe place to have fun "but also experience a relationship with Jesus Christ, whether a brand new one or a deepening of the faith they have." "I think that camp, and summer camp specifically, has the ability to change people's lives," he said. "That's why I do what I do, because it changed my life." To encourage more UM churches to promote the Florida Methodist camp experience in their youth groups, the conference Board of Camps and Retreat Ministries offers a $400 scholarship for a camper from any church that has not sent any kids or teens to a Florida Conference camp in the past three years. 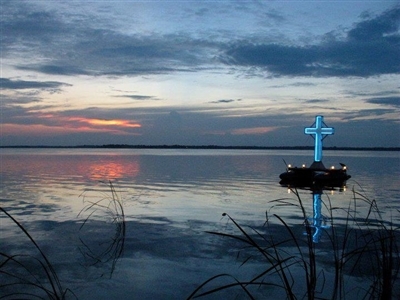 By day or night, the cross on the water at Lake Griffin is an icon that Warren Willis summer campers remember year after year. Photo from Warren W. Willis Camp staff. Warren W. Willis: This shady spot on the shores of Lake Griffin is where the Florida Methodist camp experience began, and it remains the most visited of the conference's retreat centers. Last year, nearly 3,900 youngsters spent some of their summer at Warren Willis. Two giant waterslides make the site's newly renovated pool a popular place for splashdown, and there's a ropes course for those who like it up in the air. The camp also offers canoeing and sailing. The summer program will offer eight separate weeks of "classic camps," with programs and lodging tailored to different age groups. Rising fourth- and fifth-graders play, stay and worship together, as do rising sixth- to eighth-graders. High school students have their own program, and this is the third year that the camp will extend an invitation to this year's high school graduates to come back for a final summer camp with other high school students. For high school students willing to wander a bit to experience the beauty of God's creation, there are out-of-state trip camps to hike, rappel and do white-water rafting. Warren Willis offers two weeklong wilderness camps and two weeklong opportunities to hike a portion of the Appalachian Trail. These camps have limited capacity and fill up fast, as does the one-week Suwannee River Canoe Trip. There's also Creative Spirit Camp, scheduled for June 10-15, for rising fourth-graders through just graduated high school students who like to worship God through the arts. Students prepare a performance to share with other campers and their parents at week's end. For younger children within driving distance, Warren Willis offers weeklong day camps all summer long. Youngsters who will be in first through sixth grade in the fall are eligible. Hiking trails and canoe opportunities help summer campers at Riverside Retreat explore God's wilderness wonders. Photo from Riverside Retreat. 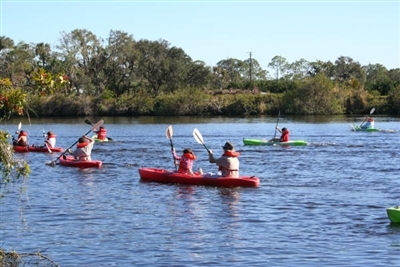 Riverside Retreat: Formerly the South Florida United Methodist Camp, this site on the Caloosahatchee River will celebrate its 50th anniversary this year with special events planned for October. Before that, though, youngsters will celebrate with three weeks of summer camp, tailored to elementary, middle and high school ages. This site is ideal for youngsters who like smaller crowds and lots of space. Riverside's 150 acres of pristine wilderness offer campers a chance to disconnect from daily routines, explore the environment and search for a spiritual connection, said camp director Martha Pierce. “There is so much beauty and wildlife here, so we try to get them [campers] unplugged so they can meet animals like the otters that are here," she said. Three weeklong residential camps are scheduled in July. Each week, 40 high school, 40 middle school and 20 elementary school students will be housed in the camp’s lodges, said Chelsey Hernandez, program coordinator. Riverside also is organizing its first fishing day camp, slated for July 29 to Aug. 2 and co-sponsored by the Florida Fish and Wildlife Commission for rising third-graders through rising eighth-graders. “They’ll be learning all about fish habitats and biology and ecology, about fish stocking and regulations and how to choose bait and tackle,” Hernandez said. For students in grades six to 12, a mission trip to Key West to build a Habitat for Humanity house is planned for June 30 to July 6. About 80 percent of campers last year were Methodist, and participants provided a picture of Florida's growing ethnic diversity, with more than 40 percent Hispanic, African American or Haitian. Almost half received scholarships, said Hernandez, adding that the aim of the camp is “never to turn any campers away." 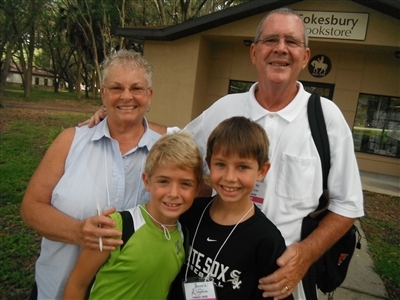 Grandparents & Me is the flagship family summer camp at the Life Enrichment Center. Photo from the Life Enrichment Center staff. Life Enrichment Center: Families that want to beat the heat and build connections with God and one another should consider summer camp at this retreat on Lake Griffin, just across Picciola Road from Warren Willis. "We offer an experience that none of our other camps do," said program coordinator Melissa Cooper. "All of our camps have their own personalities, and ours happens to be intergenerational." For years, Grandparents & Me summer camps have been building in popularity, with about 80 participants signing up for a summer session last year. Three sessions – two in June and one in July – will be offered this summer. "That's sort of our flagship program," Cooper said. "A number of grandparents have been coming here for years." The LEC added a Family Camp last year. The programs are designed to help adults and children release the stress of modern living and devote time to fun and faith formation. "It's hard to get everybody to come and sit in the same room and spend time together," Cooper said. And there's another perk: "All of our rooms are hotel-style and have their own private bathrooms," Cooper said. "It's family-oriented in programming and lodging." Check out http://lecprograms.org/ for signup and a sample camp schedule. 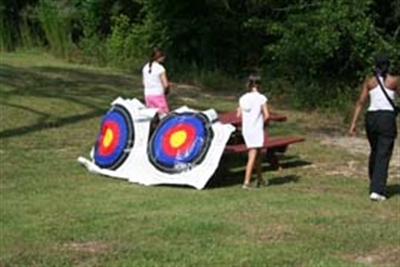 Swimming lessons, above, and archery, below, are among activities offered at Centenary Camp in northwest Florida. Photos from Centenary Camp. Centenary Camp: Located 40 miles west of Tallahassee, this camp has experienced a lot of growth and change since 2009, when the conference acquired it and adapted it from a district-run facility. Before that, its natural setting was used by various groups, but there were no ongoing programs, said Donna Bruns, camp director. As the site continues to build its programs and outreach, campers can not only soak up the atmosphere provided in the peaceful environment but participate in traditional camp fun in the pool and on a multipurpose field for volleyball, basketball and other games. There are two dorms that hold 40 campers each; a lodge with six private sleeping quarters to sleep four, each with a private bath; a multipurpose room for large gatherings; and a half-mile nature/prayer walk. Wireless Internet is available, but campers are encouraged to use it sparingly. “One of the things we try to get them to do is to focus on what the camp has to offer,” Bruns said. Day camps for kids will include swim instruction as well as crafts, songs and Bible stories. Camp instructors also provide a bullying prevention program. “We have the traditional treasure hunts and games, and we know the kids on a one-to-one basis. … We don’t have all the zip lines or high ropes like some of the other camps, so this is a good fit for kids from a more rural background,” Bruns said. A weeklong residential summer camp, separated by ages, is scheduled for July 7-13. The programs, one for ages 9 to 11 and one for 12 to 14, can accept up to 50 participants each. Most Centenary campers come from the North West District and almost all are Methodists, Bruns said. Many campers return year after year, drawn by the wilderness setting and the deer, wild turkeys, bald eagles and other wildlife. -- Anne Dukes is a freelance writer based in Atlanta. Susan Green is the editor of the Florida Conference Connection.